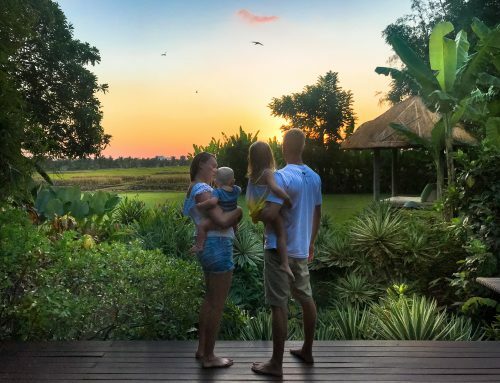 After two months tripping around Bali, we arrived at our final destination, Nusa Dua. 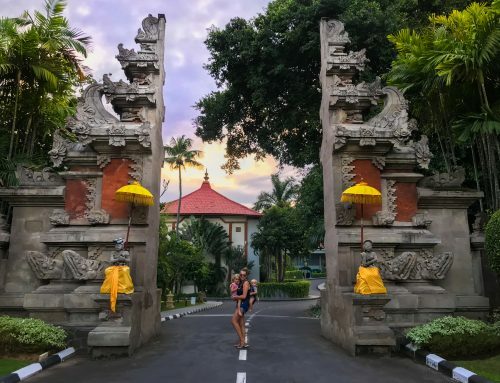 Based in the Southeast coast of Bali, close to the Benoa port, and not too far from the airport, Nusa Dua is well known for its pretty beaches. 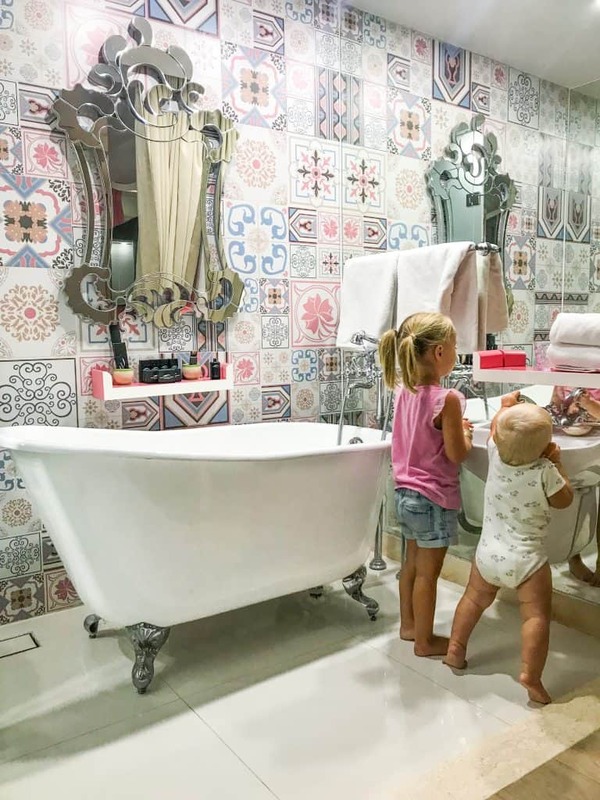 We stayed at The Grand Mirage & Thalasso Bali for a few days and we were so impressed with the family friendliness of the hotel. You could go so far as to say, it was built for families! Grand Mirage & Thalasso is a beachfront property that has two parts. We stayed in the new building, named ‘Family Paradise’. It was only open for a matter of weeks when we arrived, so it was all brand spanking new. Family Paradise and the main Grand Mirage is separated by a temple. However you can get to either side via the beach and are allowed to use the amenities of both. Of course with two little ones, we spent most of our time at Family Paradise. It was hard to get our daughter to do anything else. She was so happy getting involved in the abundance of amenities and activities for little ones. There were so many young families, so she had lots of little friends to play with. Wether we were hanging at the pool, or if she was in Kids Club, the entertainment and fun was endless. We were on the ‘all inclusive’ package. My husband really enjoyed the food. They had lots of options from, traditional Indonesian, to Italian, other western foods, as well as Indian and Chinese cuisine. There are many different restaurants on site to choose from! What really blew me away the most was the amenities and facilities for kids. Here is an overview of our favourite. 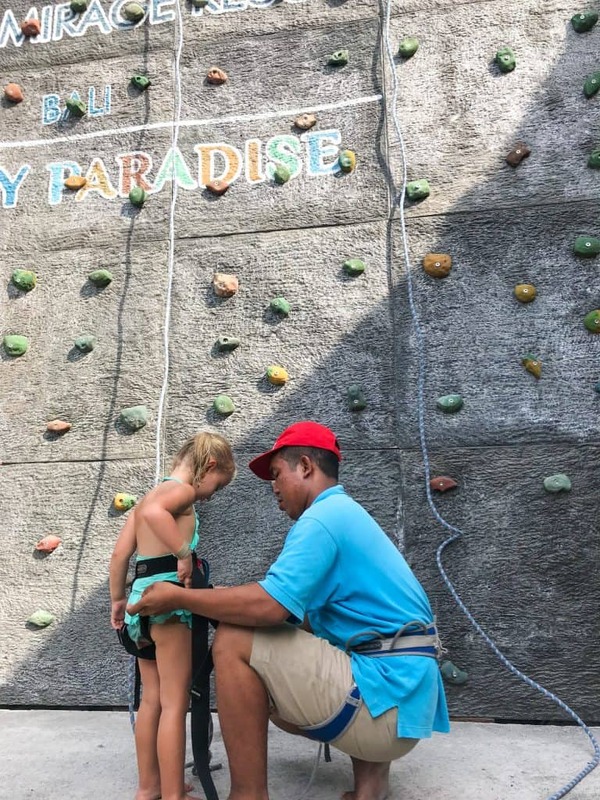 There is no shortage of activities for families at family paradise. From the daily time table that includes cycling tours, temple visits, yoga, Zumba and so on, there is something for everyone. The kids loved the craft activities, treasure hunts, feeding the fish in the pond and of course movie time. Our tot gets tired after a hectic few hours of activities so we loved the fact she could chill at some point throughout the day. They have a show on at night, three times a week. Both of our kids love music so that kind of thing is always a hit. Our kids absolutely love the water. From the kids swimming pool, to the double story hydro slide, they were not disappointed. 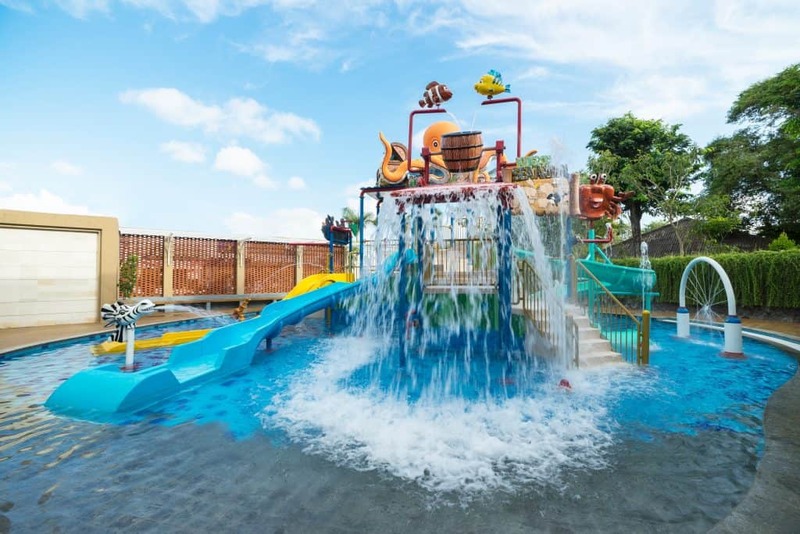 Grand Mirage & Thalasso Bali also have an ‘Animal Kingdom’ splash park. Giant cartoon like octopus and seals tip buckets of water around. 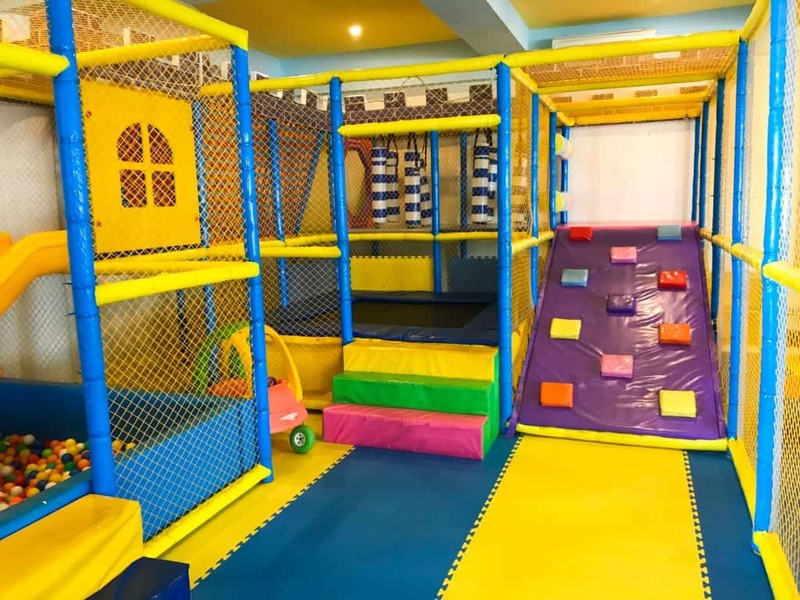 Its perfect for young kids. It was undergoing some restoration work when we were visiting. However we could see it was such a cool space within the hotel. Around in the other part of Grand Mirage & Thalasso, there were some bigger pools with a swim up bar and a mini waterfall. We parked up one afternoon and ordered three fresh coconuts. It was so lush! We loved the fact water sports are also part of the all inclusive package. 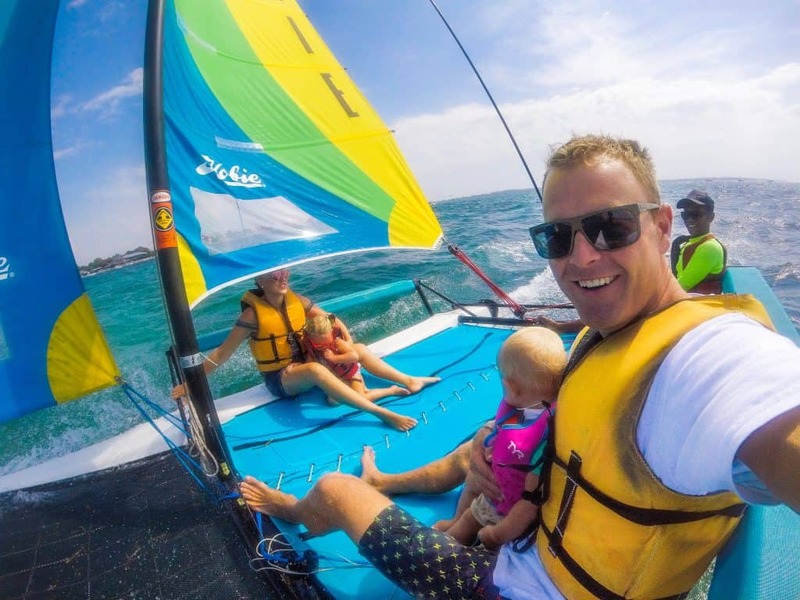 From wind surfing and sailing on a catamaran, there was lots to try. We spent our last morning on the catamaran and it was so much fun. We have never tried it before, making it all the more exciting. The first thing our daughter asked for every morning was Kid Club! She generally spent the morning there, hanging out with other kids and getting involved in the activities. She made bracelets, painted ceramics and played with kinaesthetic sand to name a few. Both of our kids loved the soft play area complete with ball pit, climbing frames and slide. It was the ideal place for our eleven month old to have a roll and a tumble safely. 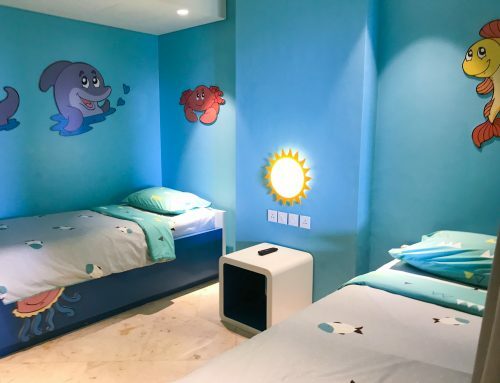 One of our favourite features at the Grand Mirage & Thalasso Bali was the cute bedroom for the kids. We had a family room with a connecting bedroom. 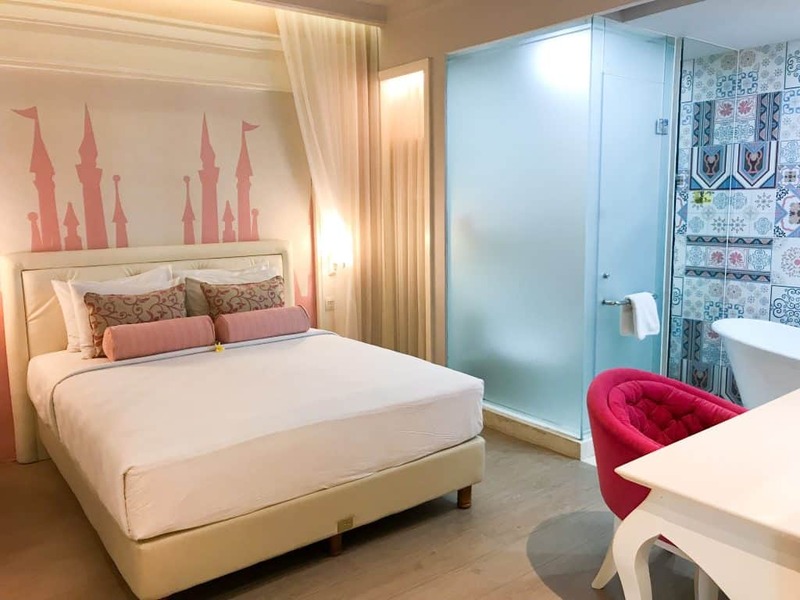 The connecting room was little a princess fairy tale. With cute cream lampshades and drapes, as well as a pink castle painted on the wall. The cutest of all was the pint sized bathroom! Everything was at the height for the kids. The toilet, the basin and the bath! It was so beautifully decorated and our daughter really appreciated the novelty of it all. The Kids Club is fully staffed from 9am to 9pm. Kids over 4 can stay but anyone younger needs a parent or nanny with them. Within the same area there are plenty of other games such as table tennis, snooker and a video games room. The best game in there is a dance one, a little bit like Wee Fit. The kids don’t stay indoors all day. The staff take them out around the resort to do different things. Overall our stay at Grand Mirage & Thalasso was absolutely awesome for the kids. As parents we were super relaxed because the kids were constantly entertained. As a foodie, I am not an all inclusive fan because I like to get out and explore the local restaurants. That said both the kids and hubby really enjoyed the food. 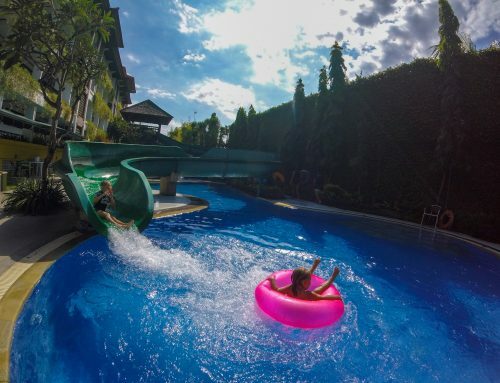 Have you found this review of Grand Mirage & Thalasso Bali helpful? Leave a comment, we would love to hear from you. If we’ve helped you in some way, we would love if you could help us too. In this digital age there is a demand for immediate information online. Being a patron is a new-age way of giving a small token of appreciation for this information, which takes time to put together, with no financial return. We offer exclusive access to blog posts before they are published as a thank you. We also offer travel advice and consultancy at different payment tiers. You can sign up to our Patron program here. Very nice to know your experiences and feedback. It would be great if you tell us what is total budget needed for this?